I never expect a favorite artist’s most recent album to be her best. When I count somebody among my favorites, it’s because something he released years ago made a huge impact on me. Maybe a band put out a string of excellent work in the early 90s, enough to cement them as legends, but after their heyday they settle into groove of sustained quality that falls just short of that peak. I don’t think Elvis Costello will release a new album that I rank higher than the two or three I consider his finest. I’m sure R.E.M.’s best work is behind them, even though I’m excited as hell about their newest release. It’s reasonable to accept that musicians hit a high point and then spend the rest of their careers trying but never quite approaching it again. Prior to 2008, I would have called Bachelor No. 2 the highpoint of Aimee Mann’s career. Released in 2000, it was her third solo album following several successful releases with ‘Til Tuesday. It came out right around her spike in popularity tied to her work on the Magnolia soundtrack and tapped into the same aching, melancholy mood as that film. Song for song, it is as confident and creative an album as you’ll hear from a modern singer-songwriter. I doubted she could ever top it. So imagine my surprise when Mann released @#%&*! 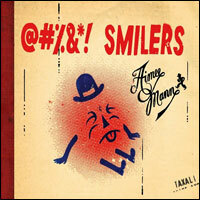 Smilers with little fanfare in 2008 and it turned out to be her most sublime work yet. @#%&*! Smilers‘ thirteen tracks tell tales of lonely souls in need of redemption. The album’s title refers to those people who walk around happy all the time for no apparent reason. This record is about everybody else. That’s the existential helplessness that Mann captures so well in so many of her songs, never more elegantly than on this album. This entry was posted in song of the day and tagged Aimee Mann, Smilers, Thirty One Today. Interesting theory about artists and their best works. I think there may be some notable exceptions in there, but by and large you are probably right. Paul Simon released Graceland and Saints after a 20 year career containing some previous highlights and after a number of lesser albums. Peter Gabriel’s So also came after a long career with Genesis and solo work. Even the Costello albums you rank so high came after a number great previous works. Still, I get what you mean in that, once the artist sets the bar so high, at whatever point in the career that happens, it is hard to top it. Simon, Gabriel and Costello probably have never topped their best achievements of the 80’s. Anyway, I have really liked all I have heard from this album and I share your appreciation for Mann’s sound and her sensibility. Good stuff indeed. I guess I can give this song some sort of mark for honesty, but it just makes me want to slap the speaker, figuratively if not literally (though I might be tempted to do that, too, if she were standing next to me). Really? You’re 31, drinking beer, calling some loser guy and feeling sorry for yourself? Why don’t you make a change? The repetition of the chorus – something I dislike in any song – is particulary annoying (and, I guess, effective) here. She certainly is in a pathetic loop – so intent on bemoaning her situation and content to leave it at that. I guess because I associate Aimee Mann with this sort of song, regardless of whether this is typical, I bristle whenever I see a SOTD is going to be devoted to her. I just want her to STOP WHINING!!!! I suspect you do have more patience for whining male sings, considering your strong affection for the whiniest male singer of all, Adam Duritz. His entire discography (which I love) is dedicated to him bemoaning his situation. I’m not defending Amy’s dissing of Mann here, but Duritz is not a good example of a whiny male singer. His music is far brighter in tone (though not always in lyrics) than the likes of Mann, Rufus, Morrissey and the like. I’m talking about lyrics, though, which I think Amy was too (at least in this case). What’s funny is that I just checked out the other Aimee Mann songs I’ve featured here and Amy said “wonderful song” or “I love this” about more than half of them. Bristling, indeed! ADAM DURITZ DOES NOT WHINE!!!!!!! “Aching”/ whiny – tomato/tomato – let’s call the whole thing off! Aching is most certainly not the same as whiny… the former has a much more positive connotation. Don’t hide from your praise! Also, one of the songs you didn’t comment on was ‘Red Vines,’ which I chose deliberately because you told me you adored it after hearing it on a compilation CD. But I’ll stop arguing… it’s silly for me to try to convince you that you like somebody you say don’t like! But I suspect you would like far more of her music than you think you would. 😉 Deal. I’m sure that’s true, as you have been right more often than not when guessing which musical artist I might enjoy adding to my collection. It was a long day, at the end of a long week, when I listened to this song, and she pushed all the wrong buttons.